Samsung Electronics has announced that its Mobile Digital Classroom will be showcased at the V&A Digital Design Weekend on Saturday 24th and Sunday 25th September 2016. The weekend, which aims to aid young people’s creative thinking and learning, will bring together artists, designers, engineers, technologists and the public to celebrate and share the latest in contemporary digital art and design, with this year’s event exploring engineering, civic design and collaborative making as part of the V&A’s Engineering Season. 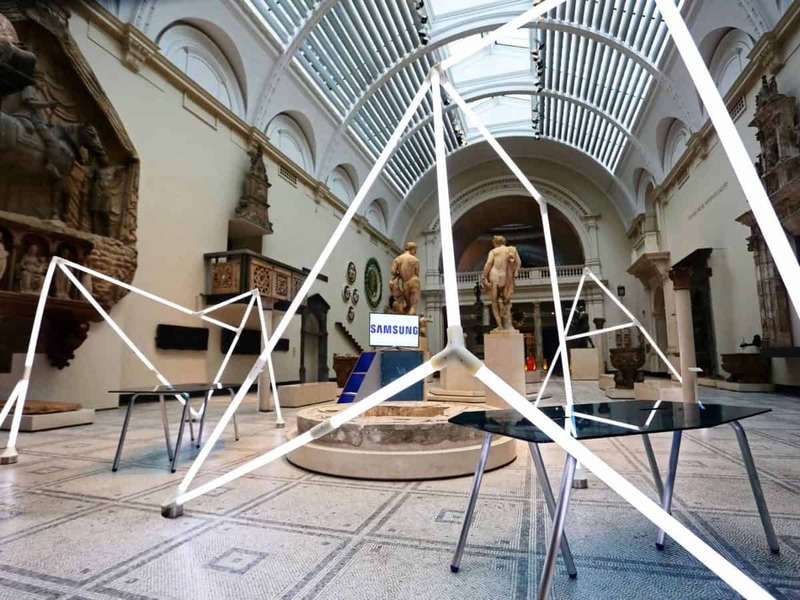 The Samsung Mobile Digital Classroom hosts monthly workshops with leading designers at the V&A and is aimed at 16 – 19 year olds, encouraging young people to explore emerging digital creative practices, in subjects including virtual reality, projection mapping and game design. As a classroom without walls, the Samsung Mobile Digital Classroom is a new, specially commissioned, classroom for immersive teaching, learning and inspiration designed by design consultancy Dubloon. The resulting structure is comprised of striking tubes of light, which create a visually unobtrusive space, enabling the public to see the workshop unfolding in front of them. Large entry and exit points are also designed to encourage a more dynamic style of learning. There are additional pieces of mobile furniture which facilitate the running of the workshops, including glass table tops which can be drawn on with marker pens to aid the development of the pupils’ ideas in a free flowing, fun way, complementing the digital technology on offer in the classroom. This weekend, the Samsung Mobile Digital Classroom will host artist Veronica Ranner, as she speculates on the bio-digital enabling material silk and body interfaces. For more information visit the V&A’s website, or follow the conversation on social using #DigitalDesignWeekend and #LDF16. The V&A’s Learning Department runs programmes, projects and activities that suit different levels of knowledge, diverse cultural and educational backgrounds, interests and learning styles in order to promote knowledge and unlock creativity. It delivers organised activities, programmes and projects for independent adults, families, young people, formal education groups including schools, colleges and universities, creative industry professionals, community groups and non-traditional museum visitors.